Little Man and I were wrestling on the bedroom floor when something hovering outside the window caught my eye. I ran over to the window and looked out to see a Ruby-throated hummingbird dart away but his lady friend kept her perch on the gutter. I ran out to the garage and snagged my feeder, filled it, and placed it outside as fast as I could but I was also annoyed with myself for not doing it sooner. I figured the migration was happening but it still seemed a bit cold so I was waiting to put the feeder outside. I planted some azaleas this spring already and the rhododendron are blooming so hopefully that was enough for my house to be noticed by those little guys that don’t remember from last year. I have been waiting for this time since last fall! We usually have a really good population and it is a lot of fun to see them all come for the last feeding of the night. It’s like hungry, hungry hippos out there with a bunch of dive bombing and jockeying. Who knew something so little could be so angry! I feel like one of our cats with my nose pressed against the front porch window waiting for the first hummingbird to approach the feeder. This also brings to mind the garage rescues that have happened since we moved into this house. 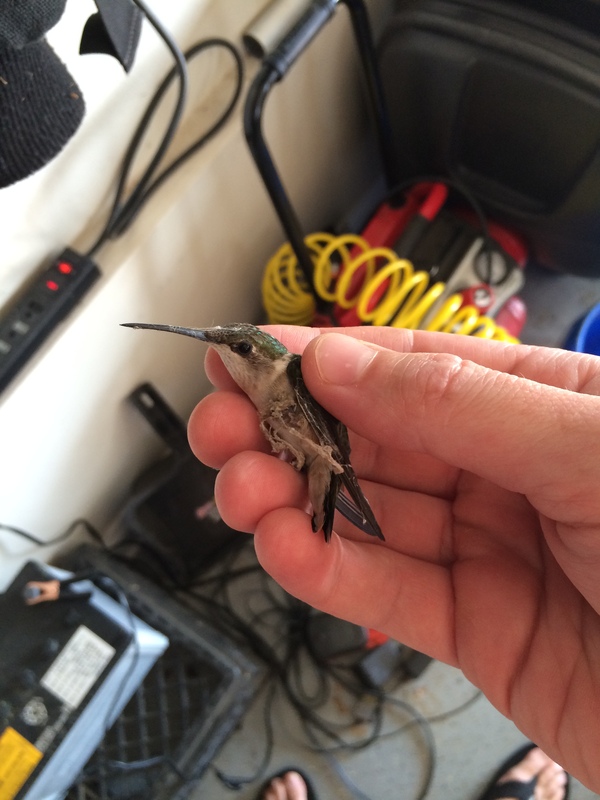 I have saved many a hummingbird from the black hole that is my garage and I can’t understand why they can fly in but not back out. The white ceiling must be confusing to them as far as I can figure. I wonder how many will need rescue this year? 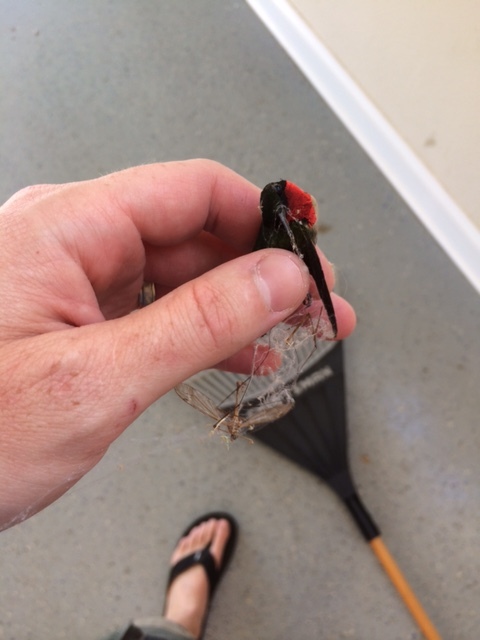 Male Ruby-throated hummingbird all wrapped up in a spider web. The hardest part about the spider webs is when it gets wrapped around their little legs. I feel like I am going to break them just by holding them as it is like trying to hold a bubble without popping it.